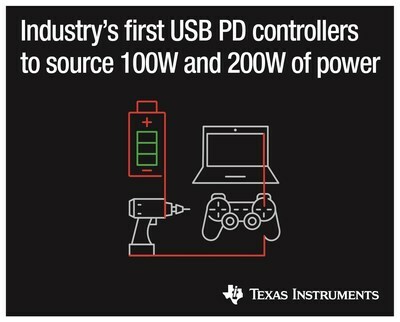 DALLAS, Sept. 18, 2018 /PRNewswire/ -- Texas Instruments (TI) (NASDAQ: TXN) today introduced two new USB Type-C™ and USB Power Delivery (PD) controllers, with fully integrated power paths to simplify designs, minimize solution size and speed time to market. The TPS65987D and TPS65988 offer system designers the industry’s highest level of integration which can reduce design complexity and overall cost. For more information, see http://www.ti.com/TPS65987D-pr and http://www.ti.com/TPS65988-pr. The devices are the industry’s first USB PD controllers to source 100 W and 200 W of power, respectively, to support computing applications and enable the benefits of USB Type-C in additional applications such as cordless power tools, gaming and virtual reality headsets. The TPS65987D, a single-port device designed to source 100 W of power, integrates independent 20-V, 5-A source and sink load switches. Low RDS(on) (25 mΩ) and reverse current protection in the TPS65987D provide a comprehensive solution for managing a port’s charging needs. The dual-port TPS65988 can source 200 W of power, and offers two integrated 5-A bidirectional load switches and external power-path control to enable simultaneous 5-A source capability. The devices are USB PD 3.0-certified, UL Recognized, and International Electrotechnical Commission (IEC) safety-certified, and come preprogrammed to support several of the most common use cases including DisplayPort™ and Thunderbolt™ applications. Additional use cases are supported through an easy-to-use configuration tool. Fewer components, simpler designs: Fully integrated USB PD controllers can help designers reduce design complexity, compared to discrete implementations which typically require 18 external power-path components. In addition, the new controllers offer integrated reverse current protection for multiple power paths, to further save board space and protect the system and controller from overcurrent. Industry’s highest power level: 200 W of power allows fast USB Type-C charging, with two integrated 5-A field-effect transistor (FET) paths to enable high-power applications such as PC notebooks, docking stations or connected peripherals while maintaining low RDS(on) for efficient charging with minimal power loss. Easily configured: No firmware development is necessary, as each device is pre-configured for the most common use cases – enabling quick and easy selection and implementation. As a founding member of the USB Implementers Forum, TI has a 20-year history of releasing high-performance, USB-compliant products. TI offers designers unmatched resources and technical expertise, including hardware design examples, the TI E2E™ Community and training content. Both devices are available now from the TI store and authorized distributors in 7-mm-by-7-mm split-pad, quad flat no-lead (QFN) packaging. The TPS65987D and TPS65988 are priced at US$1.99 and $2.99, respectively, in 1,000-unit quantities. Read the white paper, "USB Type-C and USB Power Delivery power path design considerations." Watch the video, "More ports, more problems: How TI eliminates USB Type-C reverse current events." Download the reference designs, "Power Duo Source 200 W USB-C PD" and "Power Duo Sink 200 W USB-C PD." Hear from our experts in our USB blog series. Texas Instruments Incorporated (TI) is a global semiconductor design and manufacturing company that develops analog integrated circuits (ICs) and embedded processors. By employing the world’s brightest minds, TI creates innovations that shape the future of technology. TI is helping approximately 100,000 customers transform the future, today. Learn more at www.TI.com. TI E2E is a trademark of Texas Instruments. USB Type-C™ is a trademark of USB Implementers Forum. DisplayPort™ is a trademark owned by the Video Electronics Standards Association (VESA®) in the United States and other countries. Thunderbolt is a trademark of Intel Corporation or its subsidiaries in the U.S. and/or other countries. All other trademarks and registered trademarks belong to their respective owners.